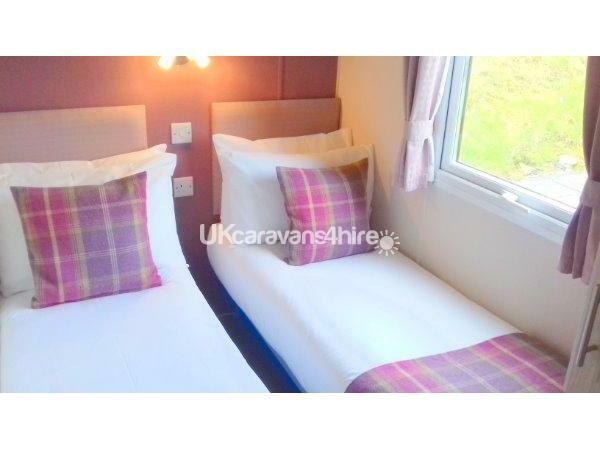 CHESTNUT CARAVAN SLEEPS 6 GUESTS VERY COMFORTABLY AND IS AVAILABLE FOR SATURDAY TO SATURDAY HOLIDAYS. 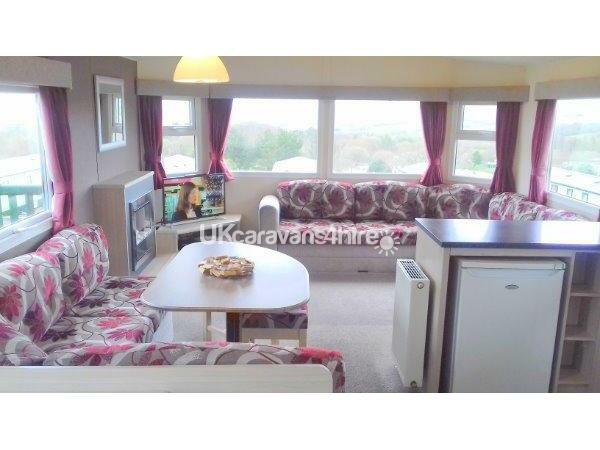 Chestnut Caravan is a Beautiful 3 Bedroom Platinum Caravan with a Fantastic Decking Area, Central Heating, Double Glazing & Surround Sound Music System. Situated in a Wonderful Peaceful Location enjoying Spectacular 180 Views over Jenny’s Lake and the lovely Countryside beyond as far as the eye can see, yet only a short walk to all the wonderful facilities the park has to offer. With quality linen, pillows and duvets, which is wonderful so you can relax with a nice Bottle of Wine & a Box of Chocolates with our compliments. There will also be a Drinks Welcome Pack containing Coffee, Tea, Sugar & Biscuits.If you fancy a nice cup of tea. We believe great service, attention to detail and a wonderful caravan in a fantastic location is what makes your holiday extra special. 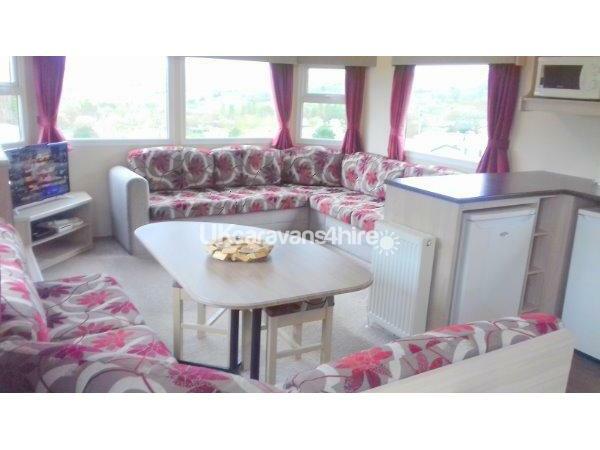 Chestnut Caravan is situated in a wonderful peaceful location not on a main thoroughfare in the Delightful Chestnut Forest area of the park, there is a parking area in front of the caravan with paved path leading directly to the front door and Decking Area. 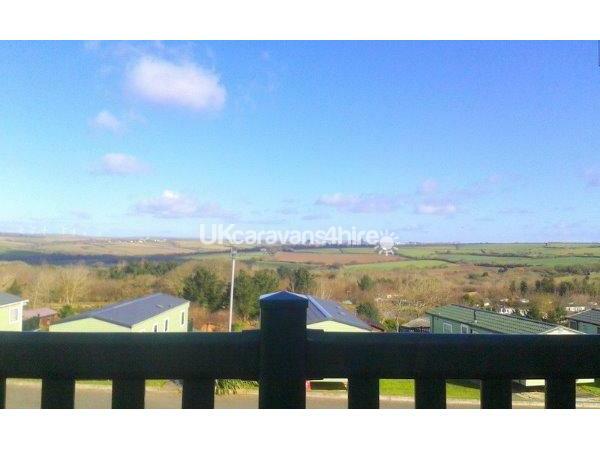 To the left of the caravan there is a large grassed area perfect for sunbathing and the children to play. There is a Lovely BBQ Especially for Dad, perfect for alfresco meals. The wonderful Large Decking Area is accessed via steps leading from the garden or directly from the caravan. 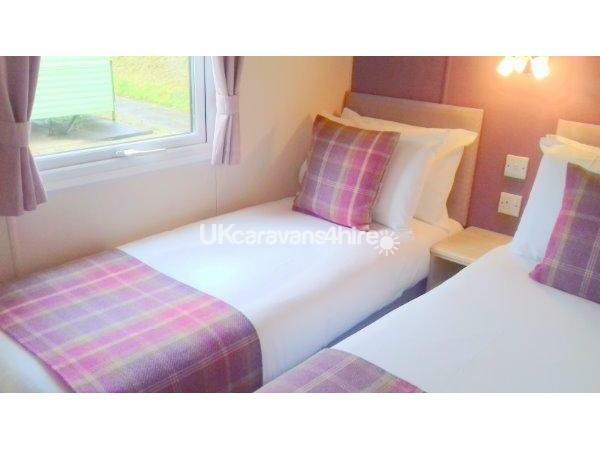 Chestnut is a Delta Jubilee Deluxe 38ft x 12ft Platinum Caravan and its detail, comfort and style has been designed to enhance your holiday experience. There are 3 Delightful Bedrooms,Separate Toilet with wash basin and a Lovely Family bathroom with Large Double Shower and wash basin. 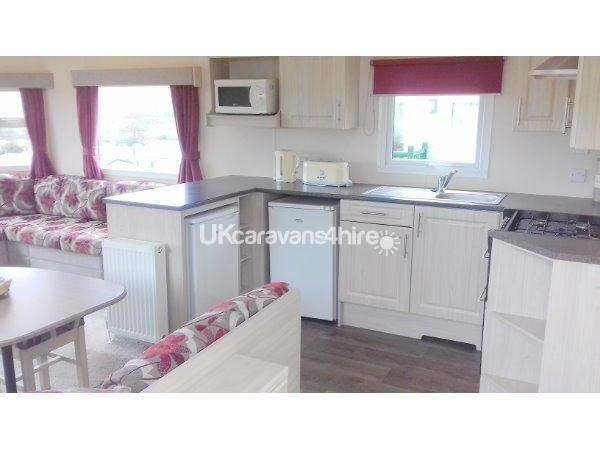 Chestnut Caravan is fully Central Heated and Double Glazed for your additional comfort. The spacious Contemporary Modern Kitchen has been very cleverly designed to provide a lovely light and open plan space to prepare your meals. The kitchen is very well equipped with everything you could possibly need including NEW NESCAFE DOLCE GUSTO COFFEE MAKER (don't forget to bring your favourite pods with you ) Fridge, Freezer, Oven, Hob, Microwave, Toaster, Kettle and all Cooking Utensils. There is an Iron, Ironing Board and Vacuum cleaner for your personal use. The beautiful lounge and dining areas have been designed with both style and comfort in mind. There is a delightful dining area with comfortable sofa seating and stools leading to the stunning lounge area with Panoramic Windows, the large seating area is very comfortable indeed with luxury fabrics and cushions. There is a central fireplace with modern contemporary electric fire,2 radiators, a New Large Flat Screen TV with DVD Player , Surround sound music system and Wii Games Console (please bring your favourite games with you). There are cupboards which contain an assortment of New Games, Books, Jigsaws and DVD’s to keep the whole family entertained. A door leads to a corridor where you will find a Lovely Family Modern Bathroom with Large Double Shower, Washbasin and Heated Towel Rail. 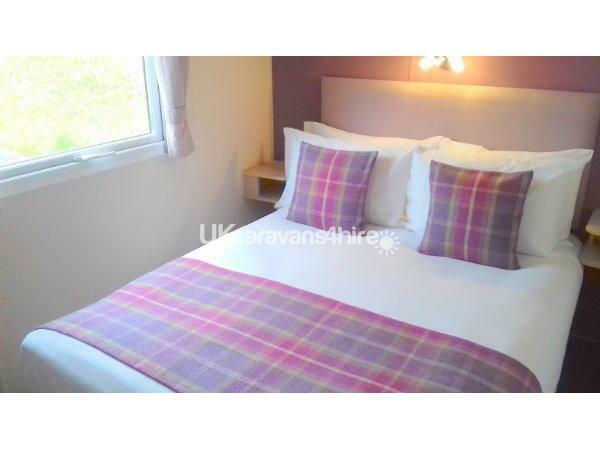 There is also a Separate Toilet and washbasin with radiator.There are Two Delightful Twin Bedrooms with Quality Mattresses, Wardrobe and Radiator. The beautiful spacious master bedroom is very light and fresh. 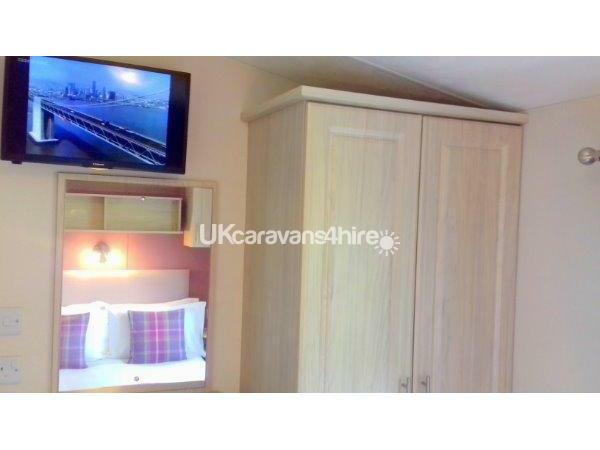 The room has been very cleverly designed to incorporate a Comfortable Double Bed with lovely wooden furniture including a New Television especially for Mom, a Vanity Unit with plenty of wardrobe storage. To make our guests feel very special indeed there will be 2 Luxury White Bathrobes (for your holiday usage), 2 Pairs of Hotel Slippers, Bathroom Toiletries and a Hairdryer too. including Quality Linen, Quilts and Pillows, Drink Welcome Pack including Tea, Coffee, Chocolate, Sugar, Milk & Biscuits, Toilet Rolls, Tea Towels and Bathroom Toiletries. We genuinely care very much about our guests and oversee all the cleaning and preparations ensuring the caravan will be beautiful upon arrival. For Guests total peace of mind we have a 24 hour emergency help line, A Guest Welcome Book, which includes lots of information about your caravan and how to operate all appliances, Contact Numbers, Cornwall’s Beautiful Beaches and Places to Visit. 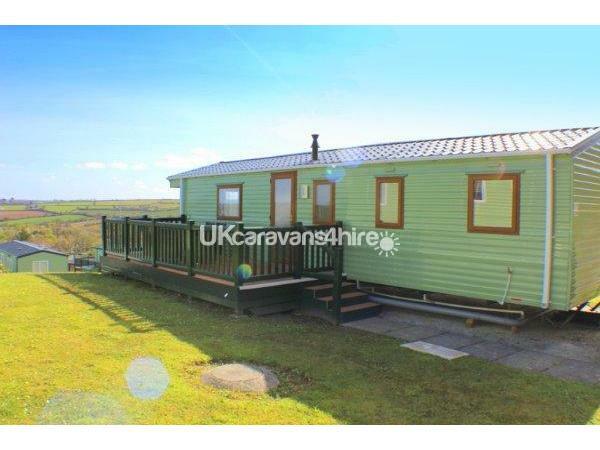 The wonderful White Acres Holiday Park is situated within 184 acres of Spectacular Cornish Countryside with 13 peaceful fishing lakes fully stocked with Carp, Roach, Rudd and Catfish yet only 5 miles by bus or car to the wonderful Seaside town of Newquay and the Famous Fistral Surfing Beach. It is the perfect location for the whole family to enjoy a wonderful relaxing and peaceful holiday. The entire atmosphere of the park is very professional yet very friendly and relaxed. The Polkerris Bar, Pizzeria and Grill is a delightful restaurant ensuring a very relaxed and Cornish friendly welcome. The park is very safe for children and the staff are very friendly making a lovely holiday experience. There is lots to do at this beautiful park to keep the whole family entertained but if you prefer a more relaxing holiday you can take a leisurely stroll around the Gorgeous Lakes, enjoy a Picnic, Feed the Ducks or enjoy a Spot of Fishing. The wonderful Surf Capital of Cornwall, Newquay is only 5 miles by car or bus, where the surf atmosphere and very laid back nature of the town is captivating. Here you will find the famous Fistral Beach where the worlds Boardmaster championships are held every year. Newquay is a fantastic seaside location with lots of Souvenir Shops, Restaurants, Cafes and Beaches. Parents can sit and enjoy a nice cool drink in one of the beach bars while watching their children have the time of their lives. At White Acres Holiday Park guests can be as active as they wish or take it nice and easy. The park has everything for everyone and includes: A wonderful Indoor Heated Swimming Pool with Toddlers Pool, Inflatable Island, Body board Races and Inflatable Kayaks, Gymnasium, Sauna ,Jacuzzi, Solarium and Beautician. The Galleon adventure playground will guarantee to keep your children very happy indeed, there are also Additional Playgrounds, Indoor Soft Play Areas, A Recreational Sports Activity Field, 9 Hole Crazy Golf, Agility Course, Mini 10 Pin Bowlingo, Lovely Amusement Arcade and Games Zone, Wildlife Nature Trails, Lizzies Allotment, Lending Library and the famous Sid and Lizzie Park Dean kids club has activities all day and evening to entertain all ages of children with Tots Stars, Star Landers and Freestyle Teens Club. There is also a lovely friendly very well stocked shop, off licence and Bakery where you can purchase your daily news paper and groceries. You do not have to be a seasoned fisherman to enjoy a holiday at White Acres, however if you are, you will be delighted with the fantastic 13 well stocked beautiful lakes full of Roach, Rudd, Carp and Catfish. White acres is one of the UK’s premier fishing destinations with a Wonderful Onsite Tackle Shop, Full Calendar of Fishing Festivals and Fun and Competitive Weekly Residents Matches. This really is an Anglers Paradise. Professional Tuition is also available to everyone if they should fancy a spot of fishing. Near to the Lakes and Tackle Shop is the lovely First Bite Café serving Hot Drinks, Breakfasts and Snacks all day long to keep you re fuelled. At White acres there is a fantastic Entertainment Venue for the whole family and younger guests can enjoy the Kids Club and meet their favourite characters too, The Fantastic Amusement Arcade that has everything from 2p Falls, Snooker, One Arm Bandits to the Latest Interaction Games. The fabulous Polkerris Restaurant, Pizzeria and Grill with outdoor terrace is highly recommended for a lovely family meal while watching the chefs create freshly made pizzas, the meals are very well priced and excellent, well worth a visit. The Polkerris Bar and Lounge is very relaxing and has a lovely atmosphere. There is also on the Park a Fish and Chips Takeaway and located near the fishing lakes is the lovely First Bite Café serving Breakfast and Snacks all day. White Acres Holiday Park is a family resort and The Park rules do not allow Hen or Stag occupancy. Additional Info: Membership Passes for The Lakeside Entertainment Venue, Bars ,Restaurants and Amusement Arcade do not need to be shown until 5pm, after this time Passes are required and are available from reception Adults £10 Children £5 and infants are Free. Membership Passes for The Lakeside Entertainment Venue, Bars ,Restaurants and Amusement Arcade do not need to be shown until 5pm.